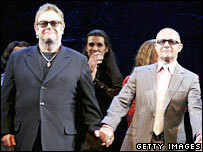 Sir Elton John's vampire musical Lestat is to close on New York's Broadway after just 39 performances. The £7m show was savaged by critics when it opened at the Palace Theatre on 25 April after a brief run in San Francisco. It will close on Sunday. Audiences last week were at 53% capacity for the show, based on the best-selling novels of Anne Rice. The star wrote the music for Lestat and long-time songwriting partner Bernie Taupin wrote the lyrics. It was the pair's first stage musical collaboration. But Variety called the show "beyond rescue", while the New York Times' influential Ben Brantley branded it "a musical sleeping pill". The show gained two nominations for next month's Tony Awards - best featured actress in a musical for Carolee Carmello and best costume design in a musical. Sir Elton has previously composed the music for hit shows The Lion King, Aida and Billy Elliott. Earlier on Wednesday Sir Elton accepted £100,000 libel damages from the Daily Mail over false claims about his behaviour. The award related to a June 2005 Daily Mail story about the star's annual charity ball. The paper falsely alleged he issued a "bizarre and absurd edict" to guests not to approach him at the event, Sir Elton's solicitor-advocate Nigel Tait told the High Court. No such edict was issued and Sir Elton greets each guest as they arrive, Mr Tait told the court. "[He] is well-known for chatting to as many people as possible who attend the ball, not least to thank them for helping him with his fund-raising efforts." The paper later published an apology and "has at no stage in these proceedings sought to justify the allegations", Mr Tait added. Sir Elton's spokesman said he was "happy with the settlement", to be donated to the Elton John Aids Foundation charity. In February Sir Elton accepted undisclosed damages from the Sunday Times, which reprinted the Daily Mail story. The songwriter felt the story had affected the image and reputation of his fund-raising efforts.